While Mexicans were hopeful for economic reform following the Mexican revolution, by the 1930s, large numbers of Mexican nationals had already moved north and were living in the United States in one of the twentieth century's most massive movements of migratory workers. 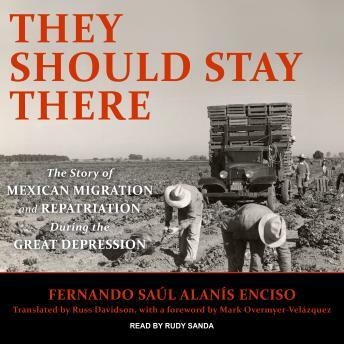 Fernando Saúl Alanis Enciso provides an illuminating backstory that demonstrates how fluid and controversial the immigration and labor situation between Mexico and the United States was in the twentieth century and continues to be in the twenty first. When the Great Depression took hold, the United States stepped up its enforcement of immigration laws and forced more than 350,000 Mexicans, including their U.S.-born children, to return to their home country. While the Mexican government was fearful of the resulting economic implications, President Lázaro Cárdenas fostered the repatriation effort for mostly symbolic reasons relating to domestic politics. In clarifying the repatriation episode through the larger history of Mexican domestic and foreign policy, Alanis connects the dots between the aftermath of the Mexican revolution and the relentless political tumult surrounding today's borderlands immigration issues.